1 × = four Required Please enter the correct value. 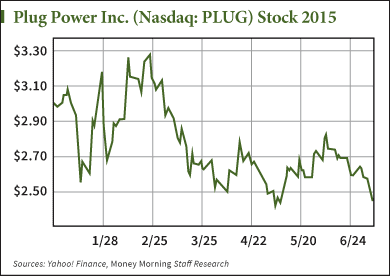 Plug Power Inc. (Nasdaq: PLUG) stock hasn't broken out in a big way since last year, but the PLUG bulls are hanging on. You see, PLUG stock was so low at one point it was in danger of being delisted from the Nasdaq. PLUG stock closed at $0.12 on Feb. 26, 2013. But it came into 2014 hot as Wal-Mart Stores Inc. (NYSE: WMT) – already a Plug Power customer – tripled its orders of Plug's flagship hydrogen fuel cell product. Wal-Mart wanted to deploy the technology for its forklift fleet in six North American distribution centers. That and CEO Andy Marsh's promises of $70 million in revenue for the year helped propel the stock 565.2% by March that year. It closed at $10.31 on March 10, 2014. But alas, the party couldn't go on forever. Noted short-selling firm Citron Research wrote a rather nasty report that leveled harsh criticism at the hydrogen fuel cell provider, primarily because of management's continued failures on matching revenue guidance and meeting promises on orders. PLUG stock is now trading below $2.50 – a 75% drop from its peak in that 2014 rally. It's been on a long descent and hasn't been able to break back above $3 since February. Now very few analysts are buzzing about PLUG stock and its potential, which is deterring investors from considering PLUG as a good opportunity. The current indifference Wall Street has toward PLUG stock undermines the impressive potential Marsh has opened up to the company since he took charge in 2008. "This is a guy that came to a company that was an experimental company focused on research," Michael Bigger, founder of Bigger Capital, told Money Morning. "Then they found a product that he could sell on a big scale and he did one of the first deals with Wal-Mart, which was super impressive." For most of its existence, Plug Power was an experimental R&D company looking to create hydrogen-powered solutions. Its first main commercial product was GenCore, an on-site electricity generation system using hydrogen fuel cells to provide back-up power for telecommunications, broadband, and utility applications. But Marsh shifted gears. He saw a big opportunity in creating and delivering hydrogen fuel cell solutions for the material handling industry. At the center of this shift was GenDrive, a hydrogen fuel cell used in material handling vehicles for distribution centers across the country. You see, most of these vehicles use lead-acid batteries. Lead-acid batteries require costly infrastructure for battery charging and changing and on average take up 7% of the distribution center's space, according to Plug Power's website. Additionally, a lead-acid battery-powered lift truck will lose 14% of its speed over the last half of its charge. Hydrogen fuel cells, on the other hand, use less electricity to bring down energy costs, operate at full power throughout the charge to limit downtime and increase productivity, and free up commercial space that would otherwise have been used for accommodating lead-acid battery infrastructure. All of this, Plug Power argues, can provide immediate savings of up to $1 million. But even as Plug Power was developing this revolutionary product – the first commercially viable solution to come out of this nascent industry – PLUG stock continued to languish until Marsh transformed the business model with GenKey in early 2014. GenKey is a comprehensive service that offers the GenDrive fuel cells, GenFuel – the hydrogen refueling stations, and GenCare – the customer care and maintenance service, all at once. This has helped Plug Power amass an impressive portfolio of business clientele. Its largest customer is Wal-Mart, but other notable customers include SYSCO Corp. (NYSE: SYY), Procter & Gamble Co. (NYSE: PG), Kroger Co. (NYSE: KR), and The Coca-Cola Co. (NYSE: KO). Wal-Mart is employing the GenDrive solution in eight U.S. sites with three more in Canada – a huge endorsement of hydrogen. "Wal-Mart was validating the fuel cell productivity solution… Wal-Mart is a standard in terms of logistics excellence," Bigger said, adding that with Wal-Mart's endorsement, more corporate clients are soon to follow. So why, if such a fundamental shift looks to be taking place in distribution centers across the country and Plug Power is positioned to reap most of the benefits, is PLUG stock unable to break out in a meaningful way? Why Is PLUG Stock Going Down?